Researchers are investigating whether time spent by children and pregnant women in our lush outdoors could prevent adverse health conditions in New Zealand children. The study is using Statistics New Zealand data to follow a cohort of babies born in 1998 from the prenatal stage until they are 16 to 18 years old. Researchers look at where the babies or children live and satellite data is used to map the area and measure how much greenery or biodiversity is in the area. Some of the outcomes that researchers are focusing on include birth weights and poor neuro-psychological outcomes and the link between how much time the pregnant mother spent in green spaces. It also specifically assesses the link between exposure to the natural environment and both ADHD – attention deficit hyperactivity disorder – and asthma. Massey University’s director of public health, Jeroen Douwes, was leading the research paper, which also involved Massey researchers Andrea ‘t Mannetje, Marine Corbin and American researcher Geoffrey Donovan. Douwes said the results could be beneficial in a handful of ways. If a substantial link was established, Kiwis could begin troubleshooting to better their kids’ health in the future. Aucklander Inna Sullivan took her 5-month-old son Stephen Sullivan to Victoria Park every day, where she said he loved watching the trees. “This is the exciting thing of course,” Douwes said. In the long run it would be “a lot cheaper”, the professor said, to generate some more green space in urban environments than to treat people for most of their lives for conditions like asthma. 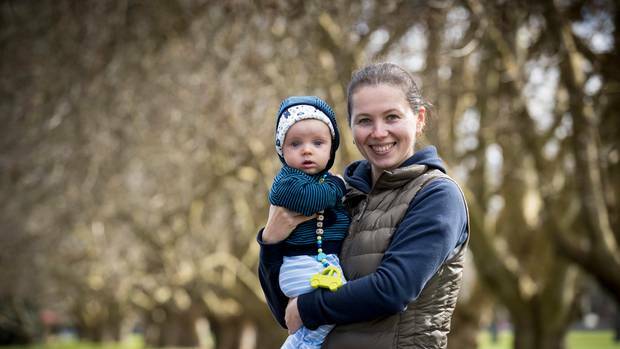 Aucklander Inna Sullivan was a regular visitor to Auckland’s Victoria Park with her 5 month old son Stephen. Sullivan, who lives in a city-centre apartment, considered the time outside “extremely important” for her boy’s development. “He loves watching trees, he loves watching other children play, Sullivan said. The new mum was not surprised researchers was probing a potential link between babies’ health, and time spent amid nature. Sullivan doesn’t have a backyard and said it was great to have a couple of parks in the city to spend time in. Portland-based researcher Geoffrey Donovan became involved in the project after speaking to a mutual friend of Douwes. Donovan, who worked for the United States Forest Service and focused largely on the benefits of access to the natural environment, said the IDI data available through Statistics New Zealand was a “richer” data set, than many in the US. It enabled the group to carry through with a longitudinal study, he said, the results of which could be useful in consideration of urban planning overseas, as well. The hypothesis for the study came about from existing literature suggesting proximity to green spaces had health benefits. “There’s one study for instance which is quite fascinating which started all this, it shows that people recovering from surgery who look out over green space recover more quickly than patients who don’t have those views,” Douwes said. In the future, Douwes hoped the research system could be applied to looking into whether exposure to green spaces had any impact on leukaemia in children.